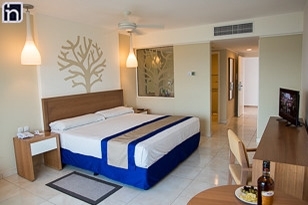 Hotel Dhawa Cayo Santa Maria is a brand new luxury hotel in Playa Caracol, one of the top beaches of Cayo Las Brujas. Las Brujas is one of the north key (cayo) of Cuba, located about 5 hours drive or 45 minutes flight from Havana. It is connected to Cuba mainland through a 45-kilometres-long causeway, known as Pedraplen, which carries on to Cayo Ensenachos and Cayo Santa Maria. Dhawa Hotel can be described as new, fresh and inventive. The smart and creative design gives all hotels ground a touch of casual luxury. At Dhawa each guest is unique and the goal is for you to have an amazing holiday and the best experience. 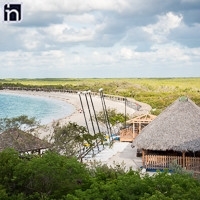 Playa Caracol, Dhawa hotel's beach, has pristine white sand and crystalline waters, ideal for swimming, snorkelling and a large variety of non-motorised water sports, including kayak, windsurf, paddle board, .. While you are chilling out at the beach, you can sip your favourite Cuban cocktail, be pampered with a personalised massage in an ocean front gazebo or just enjoy the refreshing ocean breeze. 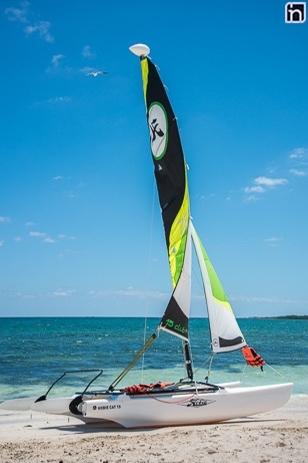 There is also the possibility to enjoy a catamaran trip and guests can ask to be taken to a more secluded beach and get picked up few hours later. 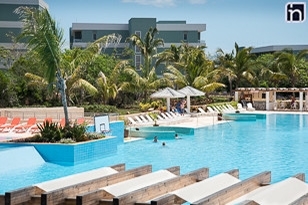 With 516 rooms, Dhawa Cayo Santa Maria is smaller than most of the other resorts in Cayo Santa Maria but it is big on sustainable tourism, with a focus on caring for flamingos who gather nearby. Recently the hotel has also stopped using plastic straws! There are eleven 3 storey buildings, all within a 5 minute walk to everything in the resort. 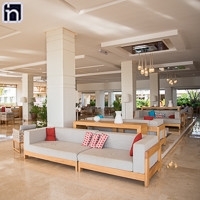 This all-inclusive has 4 main restaurants: a buffet one, where tasty breakfasts are served and 3 a la carte, Porto Fino (Italian), Maison Gourmet (French) and Fuego del Mar a Cuban Bar & Grill, with various choices of seafood and steaks. 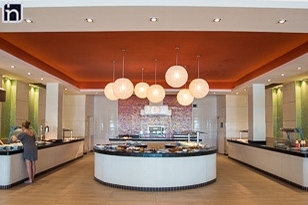 Captain Cook, the snack bar, offers quick bites and delicious cocktails 24 hours a day. 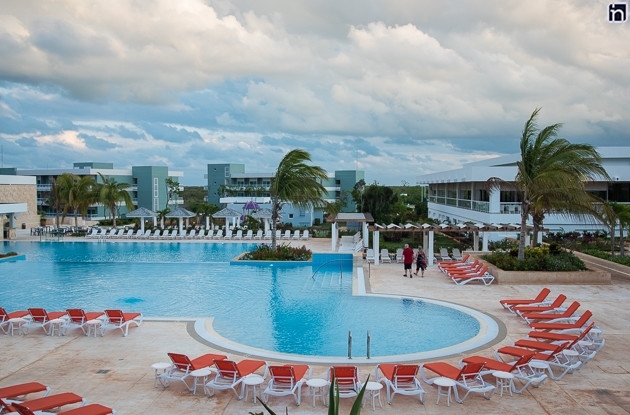 Dhawa Cayo Santa Maria has 4 swimming pools: 2 for adults and 2 for children. 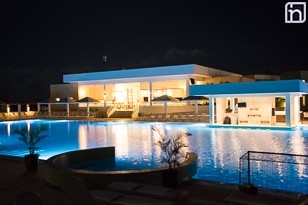 The main swimming pool is designed like a beach with varying levels of depth and secluded little cutaways with benches. Guests can also join in the fun with aqua aerobic, tennis, basketball, beach volley and many more activities. 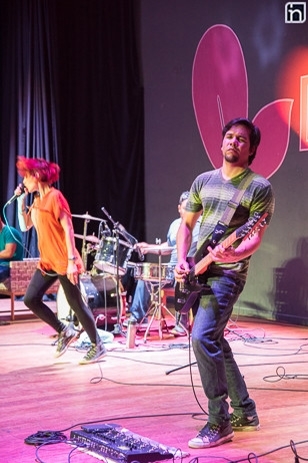 During the evenings there are entertaining cabaret shows and live music, which are always different so there is something to everyone's preferences. The service is great thanks to the very attentive and friendly Cuban staff. And at the end of your vacations, you will feel that you have made lots of new friends!